An attempt for diversity in comics will never go away. And I’m glad, because the superhero world could use more characters that aren’t white males. Frankly, as a white male myself, I have a horde of do-gooders to pick from who look and sound like me. It’s nice. Plenty of role models to choose from. But a few more options for those who aren’t white men would be nice. 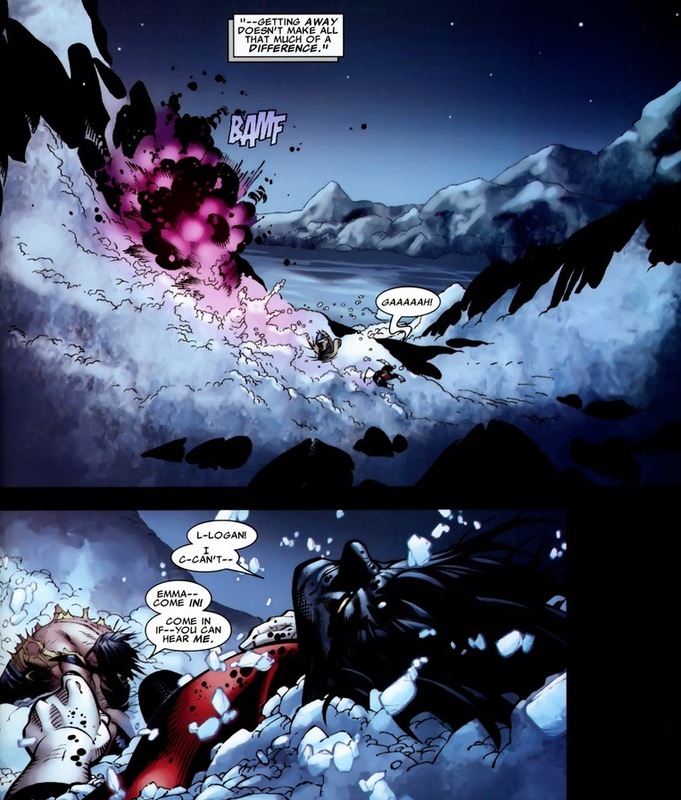 Actually, it wouldn’t be so bad to have some various colors and species among the supervillains as well. 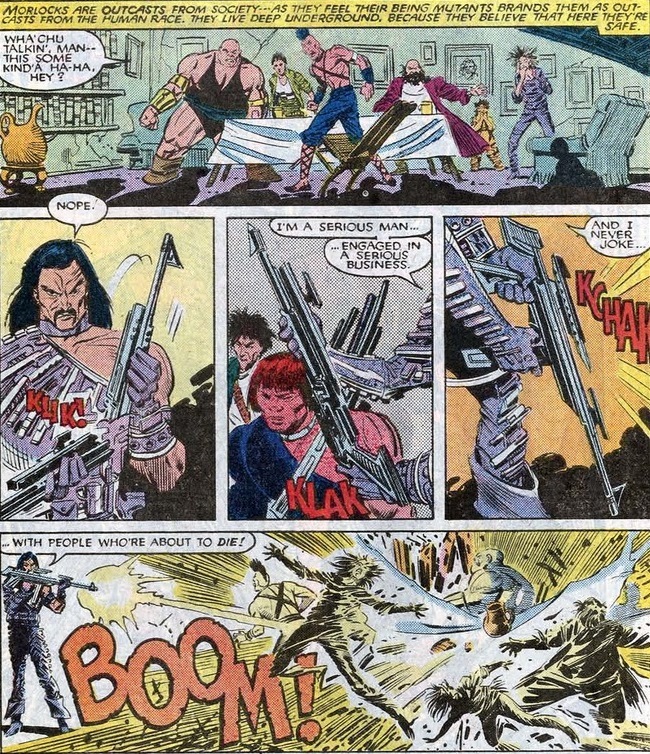 Luckily for us, Marvel gave us the Native American baddie John Greycrow — supervillain name Scalphunter. To be fair, DC premiered a character named Scalphunter a decade before Marvel, but he’s unrelated. See? The guy’s bad news. But as you know from the article title today, this isn’t only a Scalphunter story. 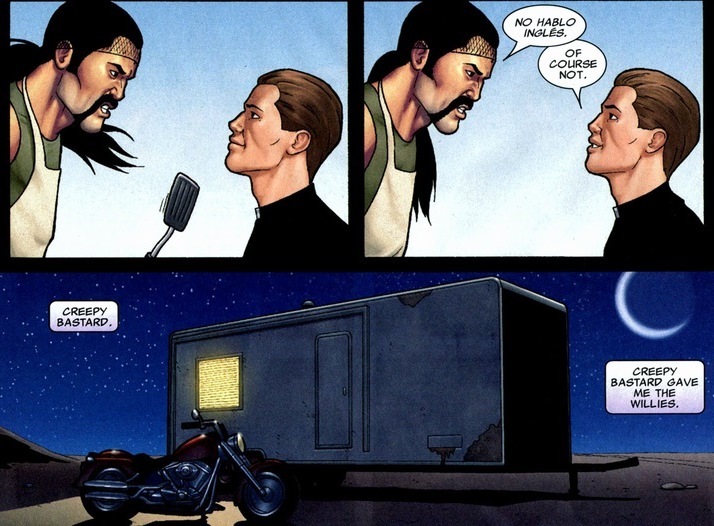 And as wildly different as Nightcrawler and Scalphunter are (Comanche techno-morph versus German Catholic half-demon) their story becomes intertwined during the X-Men event Messiah Complex. In Scalphunter’s final act of desperation, you’ll realize why Nightcrawler’ll have the baddie on his mind for quite a while. Obviously Nightcrawler gets better. 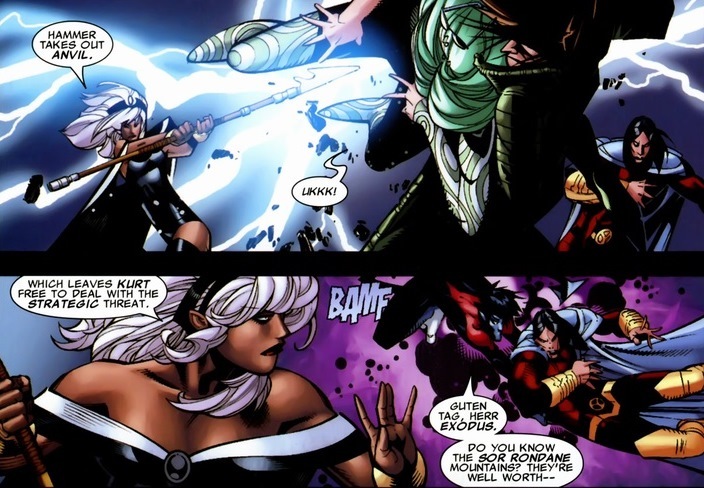 More importantly, a few months after this, Cyclops disbands the X-Men. Fallout from Messiah Complex and whatnot. 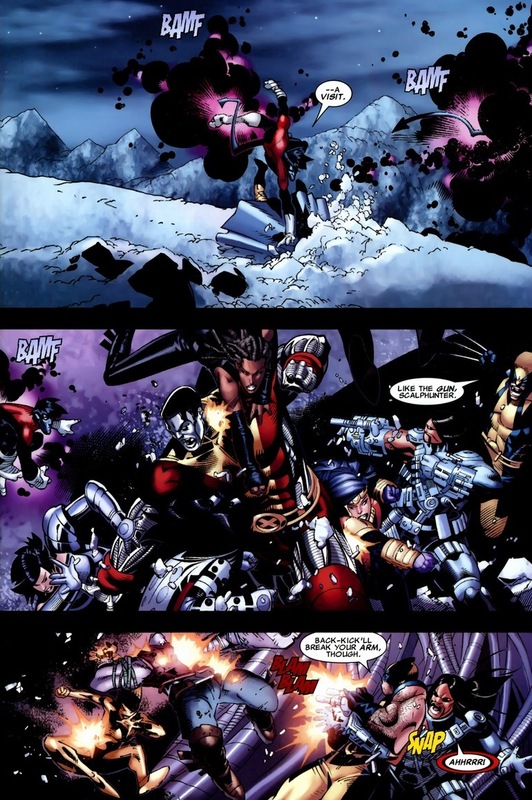 Now with the X-Men spreading throughout the country and not much on their plates (killer robots and monsters usually tend to attack groups), the mutants have time to deal with other matters. Like grudges. Scalphunter and Nightcrawler meet one more time in X-Men: Divided We Stand #1, a compilation of short stories. Ours is written by Matt Fraction and drawn by Jamie McKelvie. 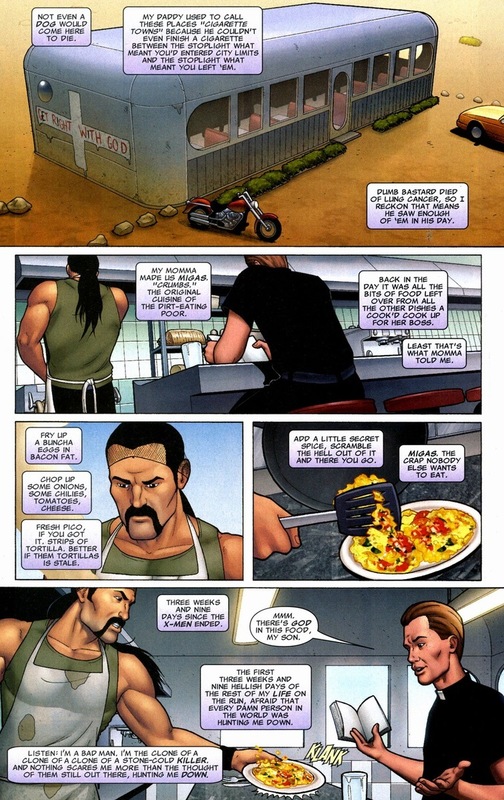 On the run, our former supervillain decides to make a living cooking in a desert diner. 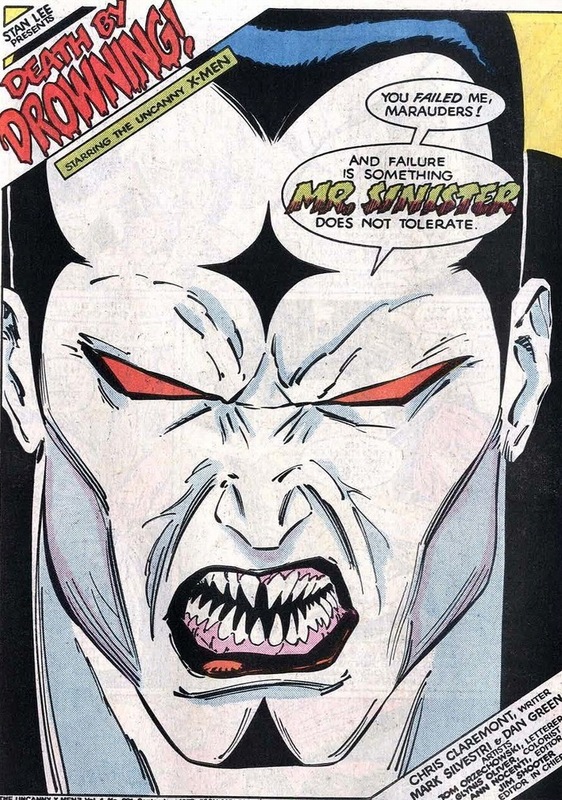 Mr. Sinister’s known for many things, like his forehead diamond and genius scientific mind (though he apparently didn’t get his PhD), but mostly for his cloning. And boy, does he enjoy cloning. Revealed eventually, every time one of the Marauders gets killed in combat (like all the time), he replaces them with an exact clone. As you saw from the Scalphunter’s internal monologue, the dude hits the pavement quite a few times. 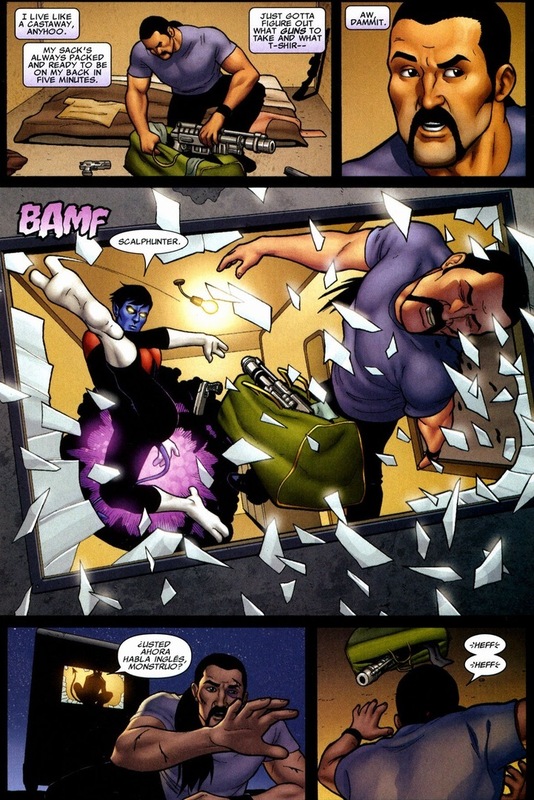 Unfortunately, with the Marauders disbanded and Mr. Sinister killed by Mystique during Messiah Complex, poor Scalphunter no longer has a replacement Scalphunter. Now he serves eggs. I know that’s a lot of dialogue. Read it all, because it’ll reward you at our finale. Have you figured out the secret identity of the talkative stranger? I’ll give you some hints: he’s a Catholic priest, he spoke German, and his name is in the title of the article. Thankfully, Nightcrawler possesses an image inducer that allows him to go into public without making small children cry. While Scalphunter’s knowledge of philosophy and art borders on extreme apathy, he still notices a weirdo when he sees one. Bad vibes are bad vibes, even from someone who compliments his pig-mush of food. Unfortunately, you can imagine the story doesn’t end with Scalphunter riding his motorcycle freely into the night. That’d be a terribly boring tale. See? I told you reading all that dialogue would pay off. 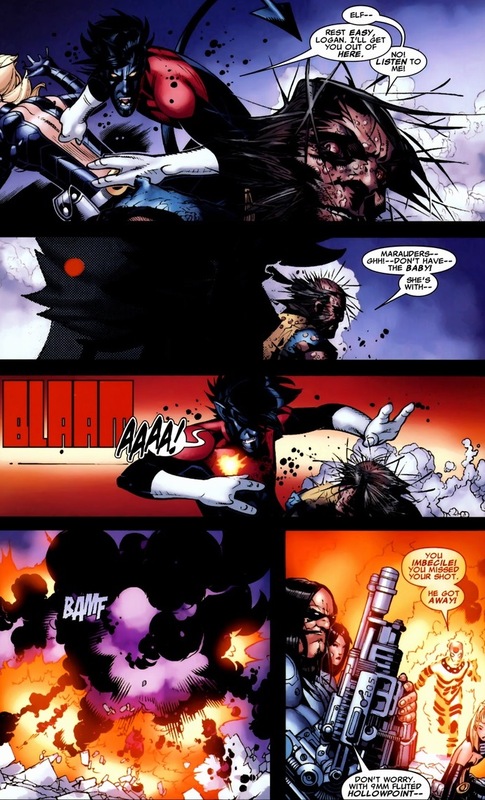 Look, besides Fraction being a genius writer, I believe the Nightcrawler’s message means simply this: the mutants of the world, who are persecuted and hated, will one day find the peace and acceptance they desire through not just physical and mental superiority, but moral as well. Which is pretty much exactly what Professor X preaches. 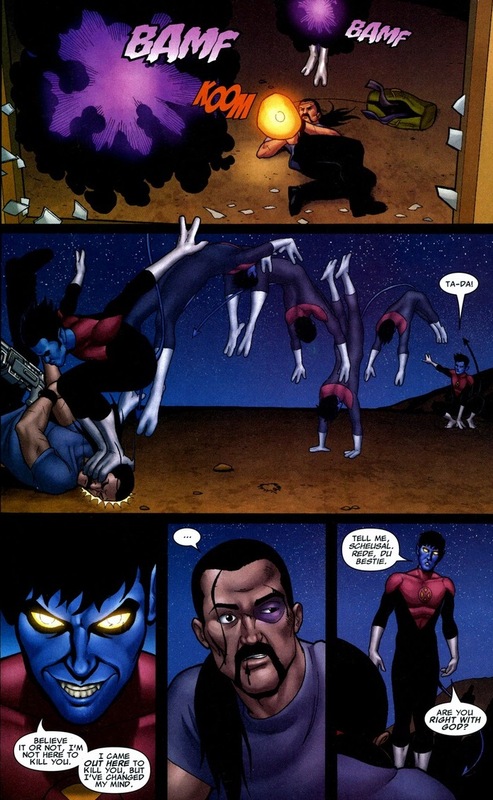 While Scalphunter totally deserves to pay for the crimes and murders he committed, instead of simply awaiting another Scalphunter clone to eventually emerge, Nightcrawler changes the course of Scalphunter entirely. Despite whatever concerns people have about religion, you cannot deny that it’s a healthy moral output for many people. Criminals have religious conversations in prison for a reason. There’s always a better way — in Nightcrawler’s case, forgiveness — and Scalphunter needed to see that instead of simply the mechanical, soul-less reproduction of his continued supervillainy. 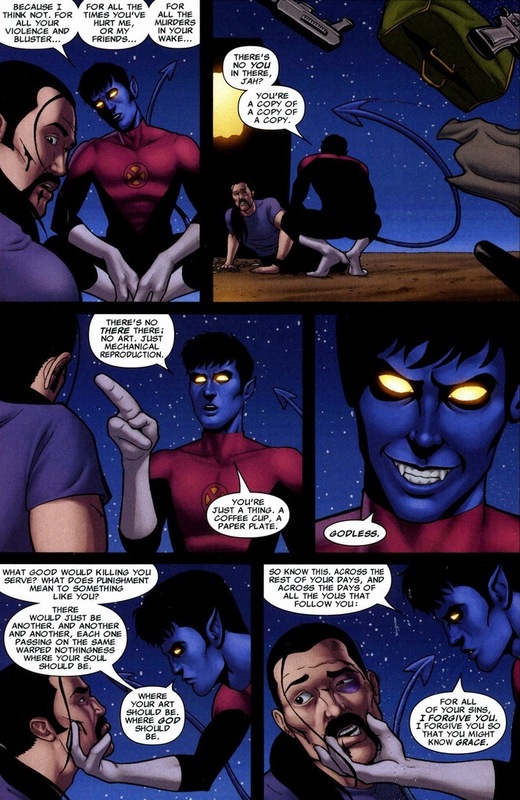 I love it, and it solidifies Nightcrawler’s place as a proper role model in the Marvel universe. 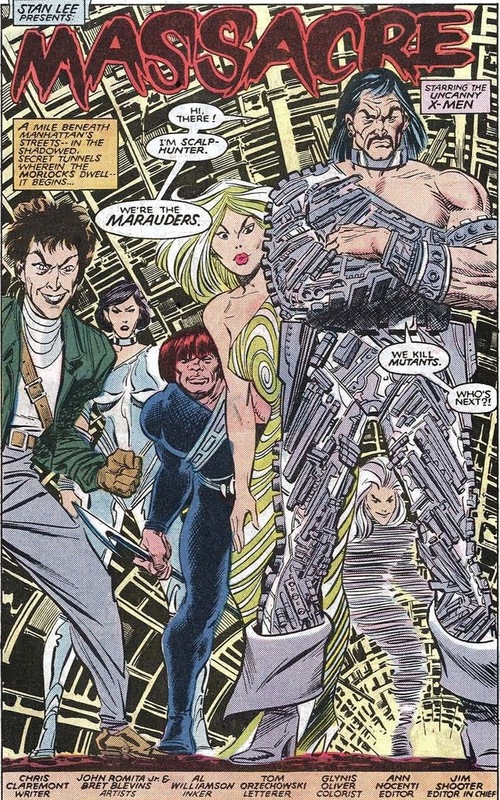 I’d like to believe if he hadn’t been killed during the X-Men event Second Coming, he would be the moral compass of the X-Men universe right now (instead of Wolverine). But he returns to comics soon! And more importantly, a German half-demon devoutly religious mutant certainly counts for diversity, right? McKelvie’s art also deserves some praise. He’s great. But yeah, that’s a really good story. Divided We Stand was full of great stories. Most of those anthologies have been awesome.